Fighting back tears, Kate Nyormoi put in personal terms why the J is so important to her. She told the audience about her 13-month-old son, Lukas, how he was born with Down syndrome. She, her husband Akim, and their older son, Parker, had moved to Louisville four years ago and had no family here to support them. So the J played that role. Today, Parker and Lukas are enrolled in the J’s Early Learning Center. Lukas is one of three children there with Down syndrome. J moms have even organized a team to participate in the Down Syndrome of Louisville’s annual Steps to Independence Walk/Run. That community will soon have a new home. 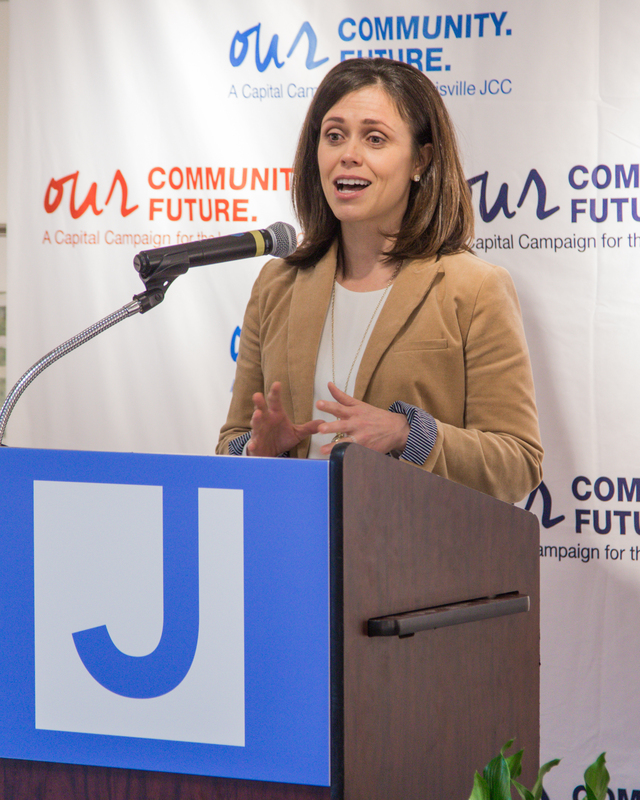 The Jewish Community of Louisville, at a Thursday media event, announced its “Our Community, Our Future” capital campaign to finance construction of a new J at the back end of its Dutchmans Lane campus, and to thank the Jewish Heritage Fund for Excellence for its “transformational” gift to the $40 project. 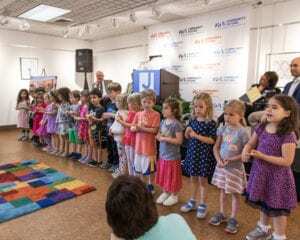 JHFE is giving $10 million to the campaign plus a $15 million matching grant, putting the campaign more than halfway towards its goal, and a possible ground breaking by the end of the year. The grant will match, dollar for dollar, gifts up to $15 million. “That is 15 plus 15 plus 10 equals $40 million,” JCL Board Chair Jon Fleischaker quipped, punctuating just how close the gift gets the campaign to its goal. The proposed J will be a modern 106,000-square-foot building, with an 80,000-square-foot footprint, and a big, blue “J” – the center’s new brand – affixed outside at the main entrance. It will boast a 12,000-square-foot indoor recreational pool and swimming facility, enhanced security features and an expanded early learning center. The Federation and Jewish Community Relations Council, which are housed in the current J, will be in the new one, too. 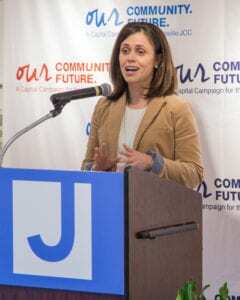 JCL President and CEO Sara Klein Wagner, said the current facility has reached the end of its lifespan. The new center will be a flexible facility, Fleischaker said, something that future generations can tweak and modify to fit their needs. She described the J as the “nucleus” of Jewish Louisville. Andrew Kusman Trager, vice president/managing director of corporate strategies for Republic Bank, who announced that his family is giving $1.5 million to the campaign, also touted the J’s appeal to the entire city. Another component of the project, the acquisition of the Anshei Sfard property, is expected to be completed by May. The purchase will enhance and expand the size of the J campus while keeping the mikvah – the ritual bath – open at its current site, but JCL officials have not yet decided how the rest of the real estate will be used. 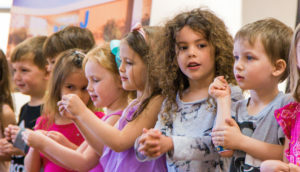 Serving 2,600 households, or 7,000 individuals, the J has been the central address for Jewish cultural, recreational, educational, artistic and community activities in Louisville since its incorporation in 1890 as The Young Men’s Hebrew Association in 1890. Today, it engages more than 18,000 people per year. It is one of the three oldest J Community Centers in the country have its own building, moving from downtown to Dutchmans Lane in 1955. The event concluded with children from the Early Learning Center’s Pomegranate (pre-K) class serenading the crowd. Wagner said the kids represent how generational the J experience is.